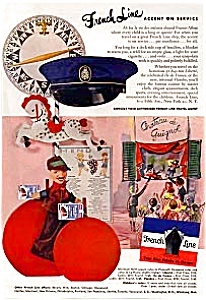 A lot of (3) color ads of the French Line. These colorful ads were taken from the National Geographic magazine of the 1950s. The ads described their service aboard the Liberte, Ile de France and other ships. These ads are in good condition. We do accept electronic payments through Paypal board.